No. 19 Oklahoma 31, no. 23 Tennessee 24. Seems appropriate, doesn’t it? And it is. If you were taking a casual glance across the Week 2 scoreboard, it would scan without a hiccup. The 19th-best team in the country visited the 23rd, played a close game, and pulled out a win in double overtime. All very tidy. In Knoxville, however, where there’s always one weary eye on the past and one wary eye on the future when it comes to the football program, the result of the Volunteers’ tilt with the Sooners is fraught with meaning. Another young Tennessee squad, hacking its way through another front-loaded schedule, fell short of putting together 60 minutes of coherent football. A team that has seemed by turns snakebit and inordinately fond of wading around in snake pits now must absorb another stinging loss. OU 31, UT 24 is just the latest variation on a well-worn theme of what if. What if the Vols hadn’t sat quite so stolidly on that 17-0 lead they built in the first half? What if they’d been more adept at on-field adjustments? What if their penalty discipline, which served them so well in 2014, hadn’t collapsed? None of these are new laments. But even by Tennessee’s stratospheric standards for close-call heartbreak, this one had to smart. Allowing the biggest comeback at home in school history will do that. 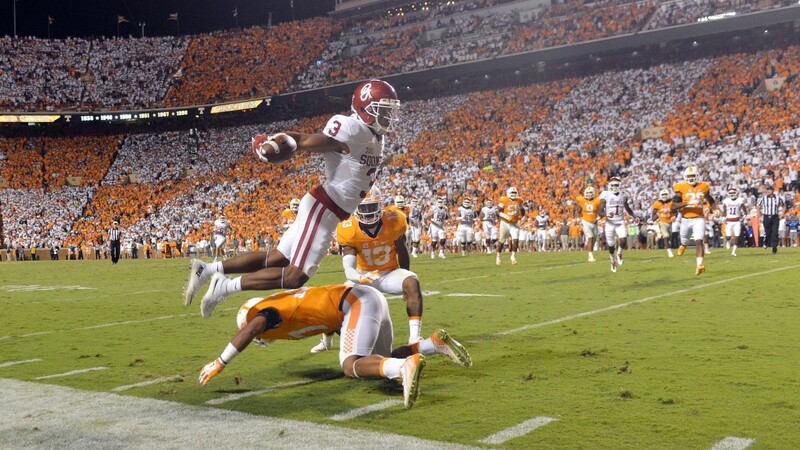 Jackson Laizure/Getty Images Wide receiver Sterling Shepard of the Oklahoma Sooners jumps over safety Brian Randolph of the Tennessee Volunteers. To hear longtimers tell it, Neyland Stadium was louder on the evening of September 12 than it had been in years, the jovial rancor of more than a hundred thousand hollering throats vibrating skulls. For a half or so of football, it had reason to be. Baker Mayfield’s first pass for Oklahoma fell incomplete, closely defended by Brian Randolph. Samaje Perine broke off an 11-yard run on second down; Mayfield hit Dede Westbrook with a 16-yard pass, and the Sooners were bounding down the field — and that’s right about the time Mayfield’s next pass bounced into the hands of Tennessee’s Todd Kelly Jr. and the noise went supernova. And then, three minutes after that, the first what-if: On third-and-goal, inside the 1-yard line, the Vols ran diminutive tailback Alvin Kamara for no gain, then backed up and kicked a field goal — and the crowd recoiled, just a little. It was impossible to help wondering whether that decision to forgo trying for six points might not be important later on. And, of course, it was. Jones also pointed out that had the Vols made a game-saving stop late, or scored just one more time, nobody would be talking about the first-quarter field goal. And that’s true enough: Tennessee did, for a stretch, hold that 17-0 lead. In the second half, however, the youth of the Volunteers reasserted itself. 2014’s sixth-least-penalized team in the country would end up flagged 10 times for a loss of 80 yards. The offense took on the plodding quality of a kicked mule. The defense had few answers for the late-game highlight-reel heroics of Mayfield and receiver Sterling Shepard. Oklahoma kicked and scratched and bit with increasing furor the longer Tennessee tried to drown it in a puddle; on one emblematic play in the fourth quarter, at least five orange jerseys missed Mayfield in the backfield on a play on which Tennessee’s defense was also penalized 10 yards. It was dispiriting all around. It’s advice the staff would do well to absorb. We speak and think of players and coaches both as institutions. They’re set up by their schools, their fans, and the media as avatars of the program, until it’s almost cognitively dissonant to see them act like people. They’re praised or pilloried in the abstract, to a point where it’s easy to forget that, no, there’s no such thing as just deciding not to be affected by adverse circumstances. But the team won’t believe it’s out of the well dug by late-stage Phillip Fulmer, Lane Kiffin, and Derek Dooley until it’s in full daylight. To do that, it needs to get wins. To do that, some boldness will be called for. And it’d help if they had some luck. There is a way forward here: The SEC East is in flux, and it hasn’t produced a conference champion since 2008. The two biggest games on Tennessee’s schedule, at home versus no. 7 Georgia and away at no. 2 Alabama, sit squarely in the middle of October, separated by a bye week. Between here and there is a trip to see a Florida team that’s breaking in a new head coach and a home game against an Arkansas squad that just lost to Toledo. The pieces of this program are still so young, still erratic, but what might they look like with some actual win-loss momentum behind them? Last season’s bunch, overrun with 18-year-olds, found the going slow and painful in Norman. This season’s iteration, replete with 19-year-olds, has made a clear stride. Good enough to roar early, if not enough to endure late. It’s not a bad plateau to be on, but it’s also not an acceptable destination, not in this town, not in this league. Since the signing of Jones’s splashy 2014 class, 2016 has been pointed to as the year to look out for, the year that the bumper crop of blue-chippers enters its junior season. But if they can’t figure out how to win games they ought to — and games they ought not — as sophomores, it might not even matter. Because here’s the thing: The closer the Vols get to contending, the more these losses are going to hurt. There has to be a chance for it to hurt this bad. Tennessee football, when Jones was hired as its fourth head coach in six years, had what amounted to a third-degree burn of a program — charred and extensively damaged, but at least it didn’t feel anything. Healing itches. It stings. And the losses are going to rankle, worse and worse, until the Vols can turn that feeling around on somebody else’s team.